A brand new 38Cm or 17" quality pearl necklace handmade by myself using fine quality materials , White pearls make up this necklace 5mm in depth all freshwater cultured and individually knotted between each pearl. 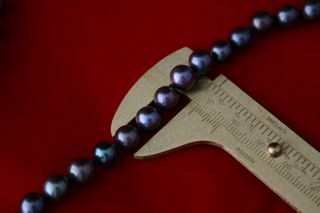 This necklace features real Hematite gemstones each 3mm round - they are beautifull , set off by 9ct gold and larger white 5mm round pearls. 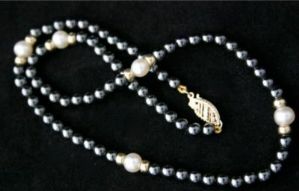 The necklace is 38cm long. The clasp is made of 9 carat gold and it is hallmarked. We have had 100% positive feedback to date. We operate a "if you do not like it, return it" policy , full details are available below and on ebay. If you have any questions at all please get in contact with me through ebay "contact sellar"